The new trailer for "Game of Thrones" has been released. 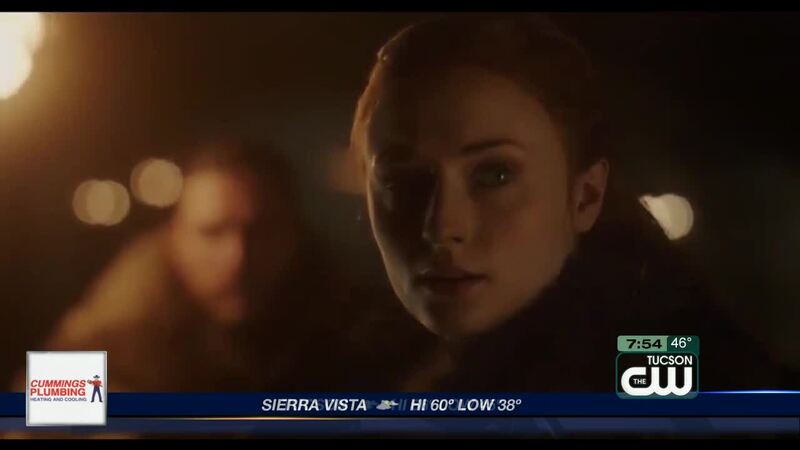 TUCSON, Ariz. - With the eighth and final season of "Game of Thrones" launching Sunday on HBO, Thronies are dissecting the major players and anticipating story developments as sports fans do the NCAA Tournament bracket. Forces of good, evil and various shades of grey in between will battle, connive and betray their way in an effort to grasp the ultimate source of power -- the spot on the iron throne. Here are our staff's opinions on who we think will wind up reigning over Westeros. Brienne. Its not even up for debate! Brienne of Tarth is the one. She's noble. She fights with honor. And she took down the Hound. Qyburn. I have no idea how it happens, but for some reason I think that Qyburn has a chance to sit on the throne. I think that Jon Snow, et al. take on the Night King and win, but are pretty much decimated in the battle. Somehow, someone ends up killing Cersei once the war is over, and Qyburn just sort of sneaks in and takes control of the broken nation. Not at all sure what happens then, but if they're not going to let the good guys win, for some reason I think it would at least be amusing if Qyburn had been playing the long con by getting Cersei to trust him. There will be no throne to take. I believe the end has to be bittersweet. Much like LOTR, George R. R. Martin wants a "victory" from an apocalypse, but a deep-seeded sadness in the end, with all characters torn from the events that have passed. Perhaps this is where the Iron Throne is essentially destroyed -- either by Cersei's own "undoing" (she would rather die than surrender) or in the battle between the living and the dead. Some will survive - bitterly scared - such as Sansa (who will most likely rule Winterfell) and Gendry (who will rule the Stormlands). Perhaps the "wheel will be broken" and a new democracy; or, splitting of the kingdoms, rather than one throne, to rule the realm. With that, Jon will rule in King's Landing and Daenerys in Dragonstone and their potential child on the "Iron Throne" within time. This can be referred back to season 2 when Daenerys has a vision of the throne, covered in snow, but turns away. Although...let's not forget Bran! He could warg into the Night King and destroy everything. Arya. I truly feel that Arya Stark will sit on the throne, all she has had to endure with her family being separated and most of her family being hunted down then murdered at the red wedding. Also, she has Brienne of Tarth to help her lead and fight to be a great new king with NEEDLE at her side!! Also she will kill the night king with Needle, I predict. Brienne AND Tormund. My hope, is that it’s Brienne and Tormund, ruling Westeros together. But I know that’s not happening. Tyrion and Sansa would be a nice reunion. And I’d say they probably be pretty just. But I know that ain’t happening either. The Night King - I’d love to believe in a love story between Jon and Danny where they both get to rule the kingdoms in a fair and just way. Obviously, the writing and foreshadowing suggests that as a possibility with the revelation of Snow’s lineage and along with the Targarian history. Unfortunately, George has proven time and time again starting with the fate of Ned that this isn’t your average fairy tale.The theme Valar Morghulis or “all men must die” is strong throughout the books and show. I can’t think of a more true fitting ending to this story than the complete annihilation of all the characters we love the most. So in the end, even though I will be rooting hard against it, the Night King will conquer all. Another vote for the Night King. George R.R. Martin's goal is to instill hope in his readers, only to crush it. My take on his vision is that he wants to show how humanity can't help but get in its own way when it comes to setting aside petty disputes in order to combat an all-consuming threat from the outside. I see the Night King and his army of White Walkers as Martin's not-so-subtle metaphorical stand-in for climate change, and predict the series will end with Westeros in tatters as the Night King concludes his soul-crushing death march with a depressing triumph. Someone who can aim and chuck a spear so well can't be beaten. No one! - A major theme in the show is the corruptibility of power: Decades of Targaryen rule led to a tortuous monster, Theon's quest for power leads to an ultimate betrayal, the Lannisters' rise to power and its disastrous consequences for all of Westeros, even Daenerys's rise to rule Essos led her to make vain and unwise choices... The list could go on and on! My theory is that ultimately Jon and Daenerys will triumph over the Night King (I know the show is cynical and unpredictable, but I don't think even they would let evil triumph in the end) but they'll use their victory and the wisdom each has gained throughout the show to institute some kind of new rule in Westeros, maybe even something close to democratic. How exactly will that look, and how will it play out? The final details remain to be seen!